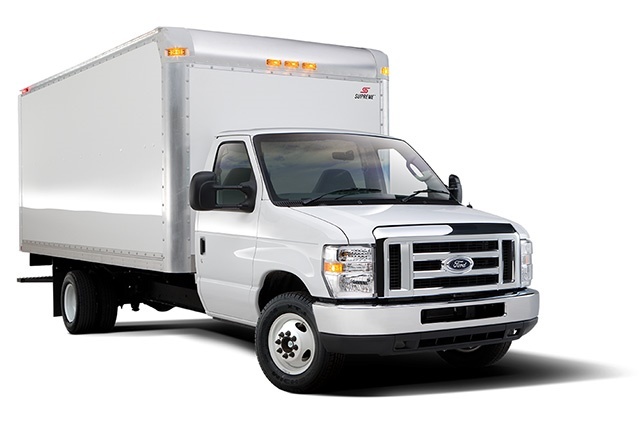 Photo of Iner-City truck courtesy of Supreme Corp.
Supreme Corporation is recalling an estimated 33,321 2003-2018 Supreme Signature Van, Iner-City, Kold King and Service Body trucks equipped with Kidde Plastic-Handle or Push Button ‘Pindicator’ fire extinguishers because they may malfunction. Specifically, these extinguishers may become clogged, stopping the extinguisher from discharging or requiring excessive force to activate it. In addition, in certain models, the nozzle may separate from the valve assembly with enough force to cause injury and also make the extinguisher inoperable. If a fire occurs and the fire extinguisher is not functional, it can increase the risk of injury and accidents. To fix the problem, Supreme will notify owners and instruct them to contact Kidde who will provide a replacement fire extinguisher at no cost to vehicle owners. The recall begins on April 1. Vehicle owners can reach Supreme customer service at (800) 352-4921 or Kidde customer service at (855) 271-0773. Owners can also visit Kidde's website, and click on "Product Safety Recall" for more information.